Contrary to popular belief, a soulmate is not always romantic in nature. Soulmates may take the form of a sibling, a creative partner, or a best friend. Having more than one soulmate is completely possible throughout your lifetime. But soulmates are not magically born, well, it depends on what you call magic. 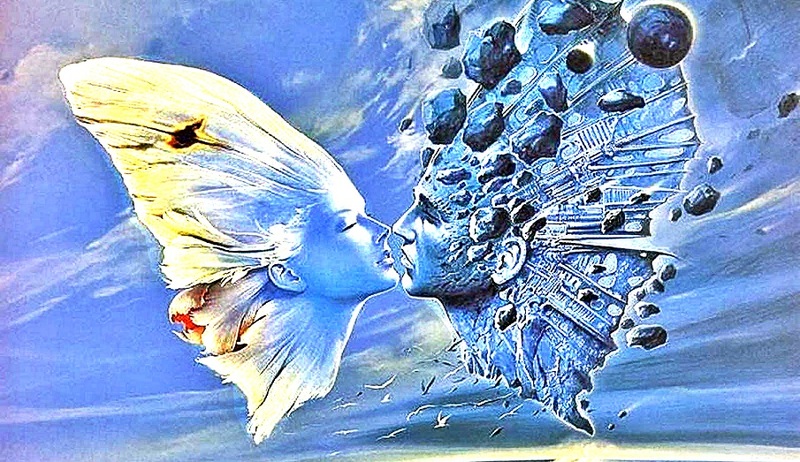 Soulmates are created when 2 regular people create such a strong and deep bond between each other that it transcends time and space. It takes a lot of hard work on both your parts to eventually establish such soul connection. It takes trust, tolerance, love and constant choice to stand by each other in order to create such strong bond. That’s why the relationship you have with a soulmate is distinct from your other relationships, because both of you invested so much in your relationship throughout many lifetimes. To find out if you have created a soul connection with someone, here are the signs! 1. You are more understanding and patient with them than you are with others. You often find yourself extending more patience and understanding with people who you’ve made a soul connection with. The things that would have irritated you in others don’t mean a thing when they come from your soulmate. You understand their hearts and it’s easier for you to forgive them. While you doubt the motivations of other people, with your soulmate you just couldn’t feel the same because you see them clearly. And seeing them as a whole human being, with pureness in their heart, comes naturally. 2. You have no personal boundaries with them. In romantic relationships, soulmates have a powerful sexual attraction; they can’t seem to keep their hands off of one another. While in a platonic friendship or family connection, soulmates are often found play-fighting, frequently hugging, holding hands, or cuddling. The closeness you have with your soulmate is not limited by the emotional level, it extends to the way you physically interact with each other. It’s a connection between all the pillars, physical, emotional, spiritual and mental! 3. Your commitment with each other lasts a lifetime. Living life without your soulmate is a thought you could not fathom because life seems unbearable without them. You have a strong commitment in looking after each other’s happiness. Whatever your plans are in the future, whether it involves having a family, starting a small business, or buying a house, your soul connection is part of your every plan. You are there to support each other’s dreams and do BIG things together. 4. You give them your undivided attention. Giving your full attention to your soulmates comes naturally. Despite the constant distractions around, you are fully focused in their presence. For some people it looks like both of you go to another dimension when you start talking to each other, a dimension only the 2 of you can understand. You listen actively and engage with empathy. This makes your soul connection grow stronger and flourishes your communication. Like diamonds, soulmates are rare and very hard to find, even harder to be created. When you finally find a person worthy to create a soul connection with, cherish, love, and respect them, choose to stand by them because that’s how soulmates are created. Your life has a lot more meaning with soulmates in it!